I’m hereby offering you all the first version of my document explaining http2, the protocol. 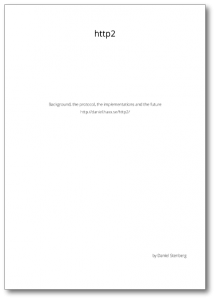 It features explanations on the background, basic fundamentals, details on the wire format and something about existing implementations and what’s to expect for the future. The full PDF currently boasts 27 pages at version 1.0, but I plan to keep up with the http2 development going further and I’m also kind of thinking that I will get at least some user feedback, and I’ll do subsequent updates to improve and extend the document over time. Of course time will tell how good that will work. The document is edited in libreoffice and that file is available on github, but ODT is really not a format suitable for patches and merges so I hope we can sort out changes with filing issues and sending emails. Thanks for the suggesting opoho, I’ll make such a version when I put the 1.2 version out in a day or two!